Vee2 Saddlebag Guard - AdventureTech, LLC. 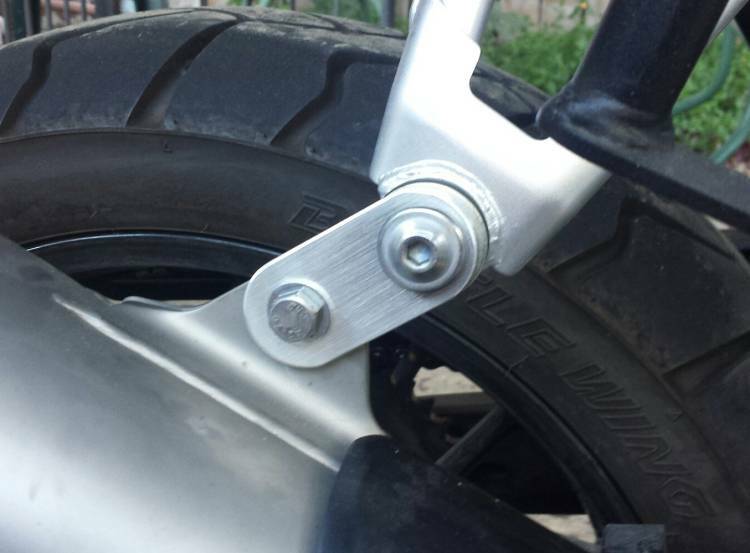 Instructions for installing Vee2 soft saddle bag guards. Remove bolts from luggage mounts on bike's frame (if installed). The support posts come in two lengths. Install the shorter lengths in the front holes, longer in back. The difference is bout 1/16" so look closely. Grip the posts by hand and thread the 6mm studs into the threaded holes on the frame. Seriously, holding the post by hand and twisting them in like using a screw driver is all that is required. Blue Loctite is OK. Attach plates with supplied 8 mm flat head socket head cap screws. As an option, you my want to use the muffler lowering bracket. I will include a bracket with the guards.